4 Season Sports offers a wide variety of fishing rods, line, lures and tackle. We have everything you need whether you are pursuing Walleyes, Flathead or Channel Catfish, Northern Pike, Largemouth or Smallmouth Bass, Panfish or Trout. 4 Season Sports features ultralight panfish rods to 14’ trolling rods from several manufactures like: St. Croix, Fenwick, Shimano, Berkley, Pflueger, Team Catfish, Limit Creek and many more. Fishing reels include: Shimano, Pflueger, Abu Garcia, Okuma, Penn and more. From fly reels to line counters we have got you covered. 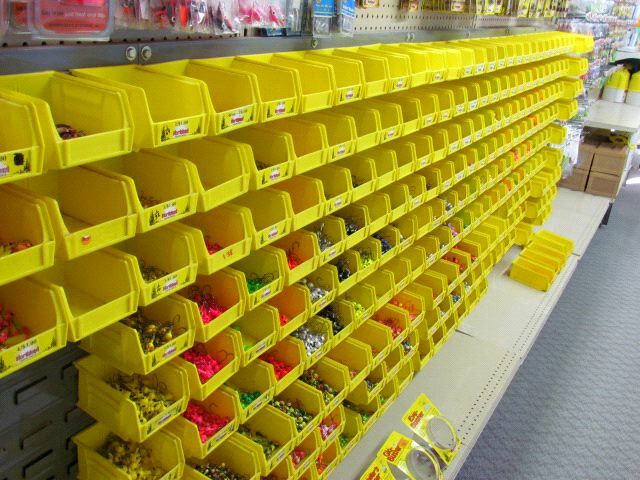 Our tackle shop has all of the hottest baits including 24’ of Rapalas, our famous 16’ long jig bar, Hand tied hair jigs from several local guys, the largest selection of B Fish N plastics and jigs you will find, monofilament, braided and lead core lines, bass plastics and hard baits, the best catfish supplies on the river, ice fishing jigs and tackle, and much more. We also provide services such as spooling reels, replacing rod tips and custom ordering items we do not stock. Advice, as always is free of charge. Our staff is passionate about fishing and will help you in any way they can.